Section 3- August 9-15, 7 days. South Lake to Tuolumne Meadows, NOBO. It is always a thrill to driving up 395 in anticipation of what is to come. I hike this section NOBO, mostly for ease of transportation. 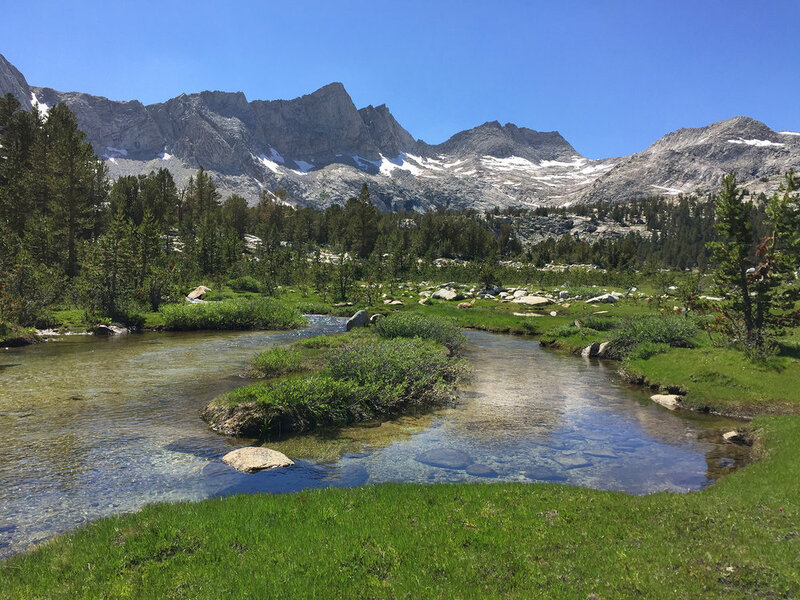 I start from from South Lake, go over Bishop Pass, and then descend 3,000. ft to the John Muir Trail (JMT) and Little Pete Meadow. The deer are habituated to people so I can photograph them easily. Less snow, but tons of flowing water. It is impossible to avoid wet feet, so just march on through. It feels strange to be back on the JMT, with all the people. Improvised snow slide below Muir Pass. 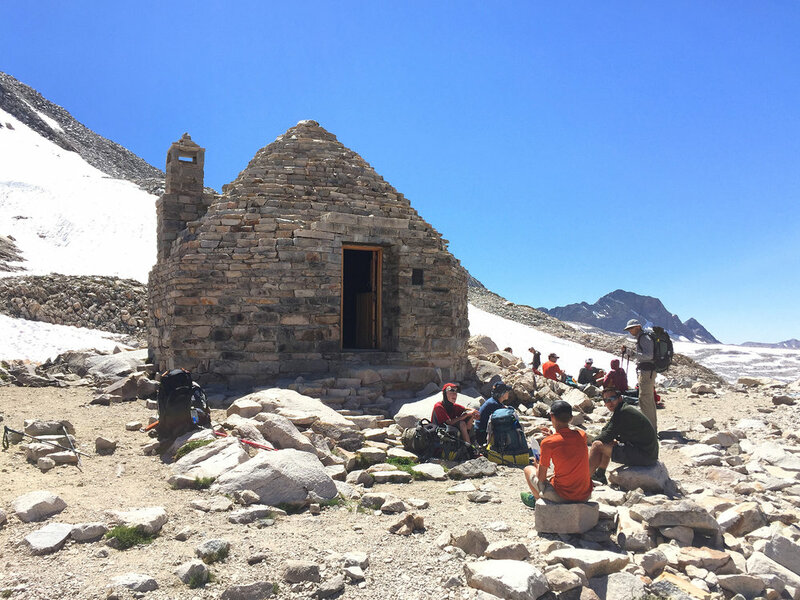 Muir Hut at Muir Pass. I am traveling alongside a wonderful family of seven, with the ages of the children ranging from 10 to 28. 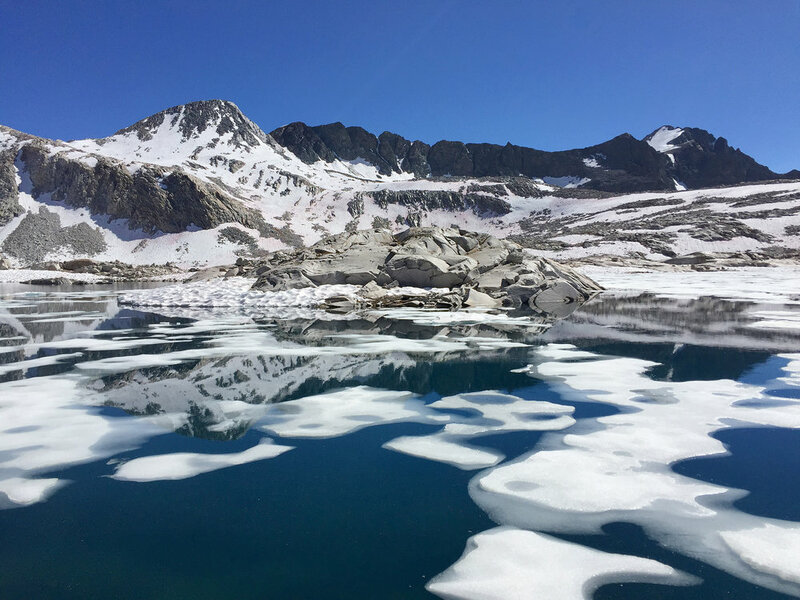 I camp at the north end of Evolution Lake, one of the most scenic camp spots on the JMT. I enjoy some time socializing with the "magnificent seven". I intuit that might hold some conservative and evangelical beliefs quite divergent from my own, but by only talking about the things we share including our love of this place, we make a meaningful connection. Why can't we Americans start seeing each other as Americans first and emphasize what unites us? 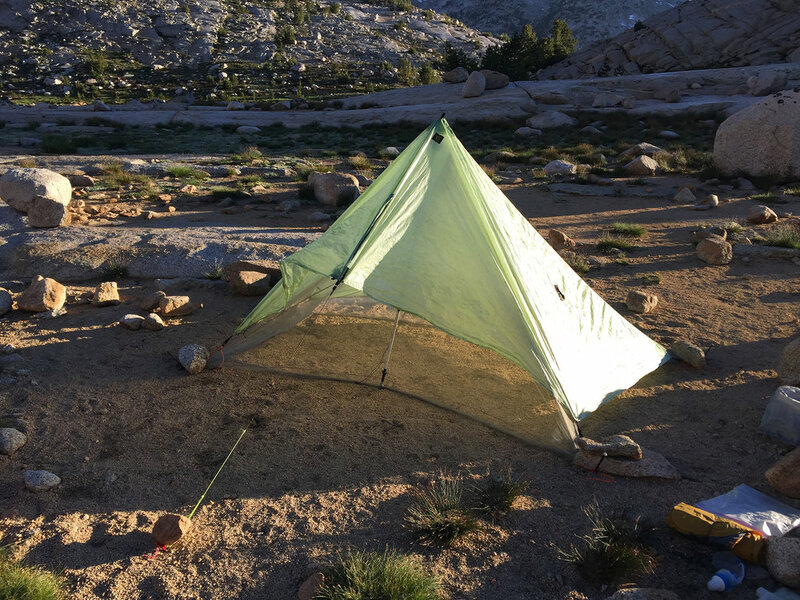 For this section I switched out my silnylon tarp for my lighter cuben fiber tarp and jerry-rigged a mosquito net inside, for a total weight of 14 oz. The next day I leave the JMT and go off-trail into the hills. 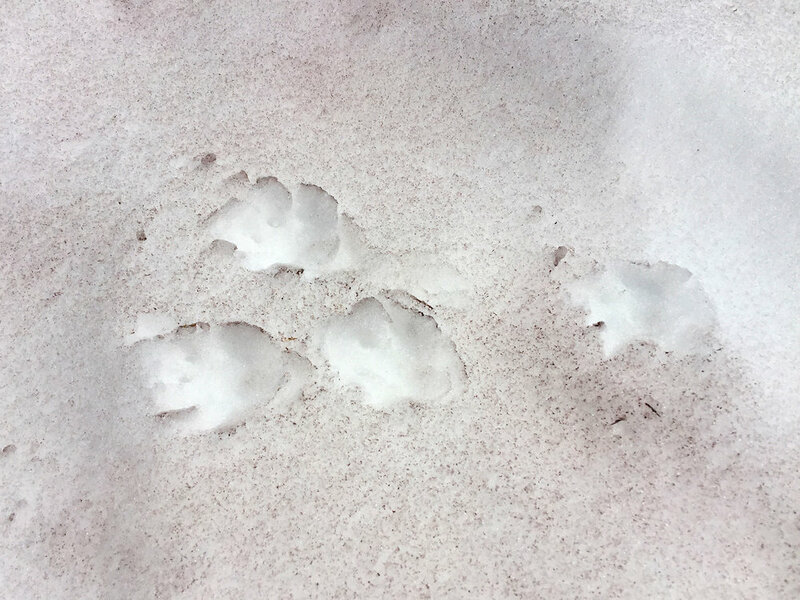 I often see footprints of small animals in the snow. 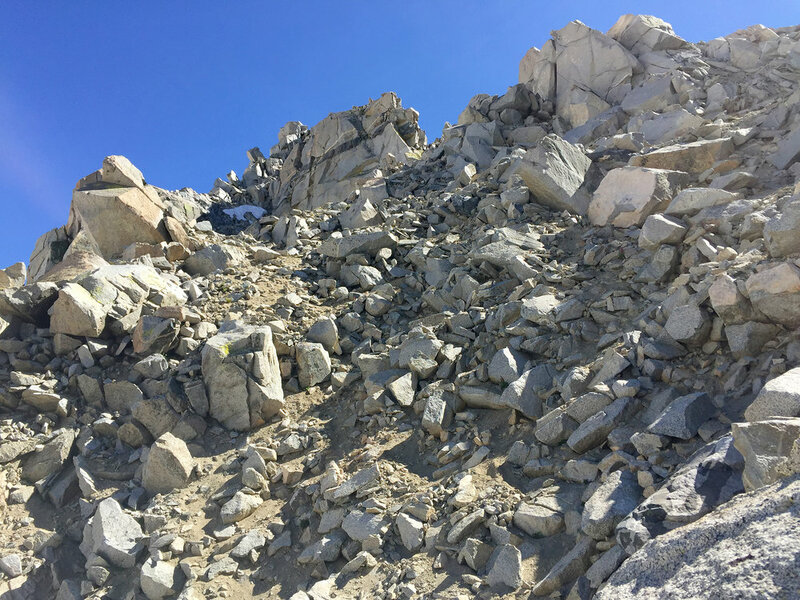 The climb up to the pass is uneventful, standard-issue talus. I reach the top of Snow Tongue Pass. There is always this moment of relief and expectation at reaching the top wondering what the descent will be. It takes some time to locate the best route down, and it looks ugly: very vertical with lots of loose rock. Ugly indeed. I usually like clinging to the sides of rock chutes and prefer Class 3 climbing to Class 2 sliding, but that is not an option here. I really can't tell which rocks will hold me and I set off some minor rockslides. I know that I can make it down safely, but it takes a long time and extreme care, which is tedious and unnerving. I scanned Roper's guide only briefly before I left, so the difficulty of this pass took me by surprise. I decide that I will put in some more effort educating myself about the route. It is a relief to drop down to the vertical snow where I can put on my crampons. From below it becomes more obvious why this pass is called "Snow Tongue". It takes awhile to walk around the talus at Wahoo Lake, after which I get a view the southern part of Humphreys Basin. I guess correctly that this area is one large mosquito swamp and decide to keep hiking into dusk until I reach the more distant, higher and drier plateau beyond. Puppet Pass overlooking Puppet lake. This area is a high shelf with no trails running through it, so it is pristine. 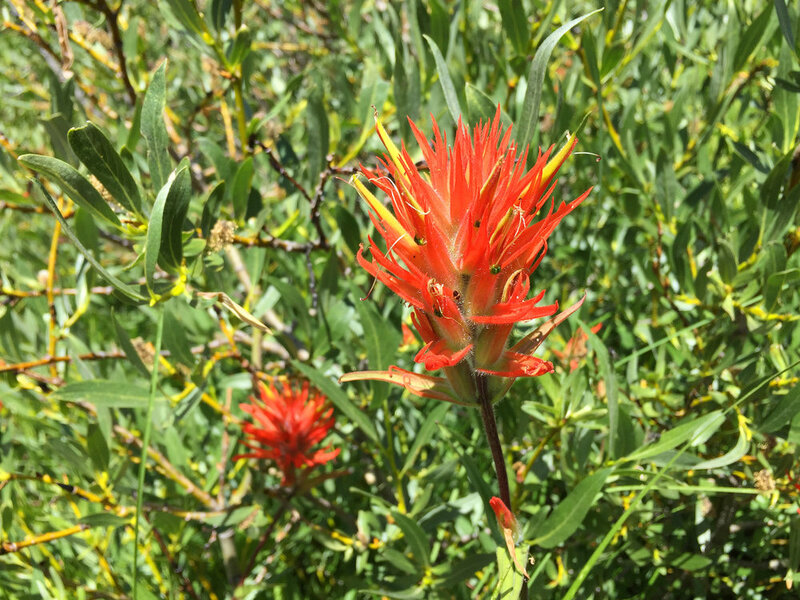 I drop to 10,400 feet into French Canyon where I witness amazing flower fields. What goes down must go back up, again and again. La Salle Lake below Feather Pass. 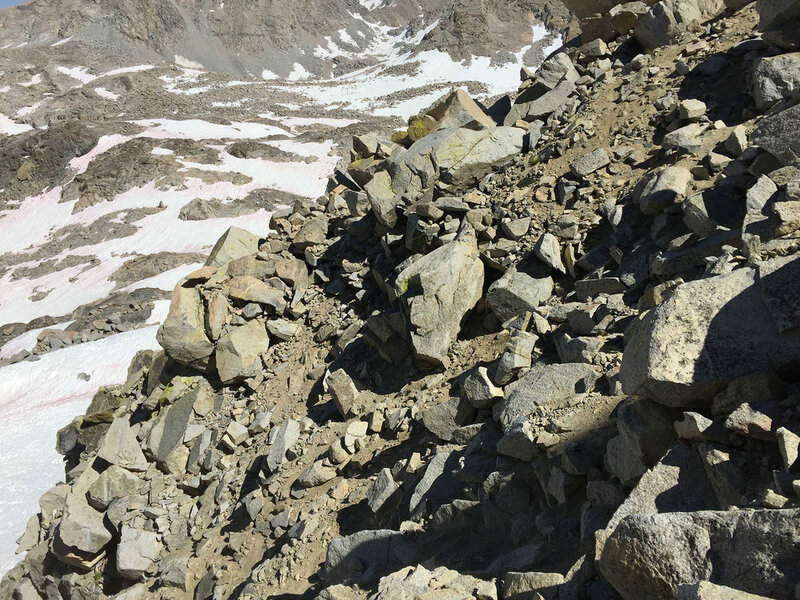 This ascent features the most enjoyable type of talus: long easily walkable slabs. I *think* that this is Ursa Lake. The route around White Bear Lake presents a challenge: I can take a chance and walk around the lower perimeter of the lake, where the snow may give way, sending me into a very cold and very wet lake, or climb high and go around to the right or to the left. I choose to climb around left and this diversion only takes an additional 20 minutes. In this screenshot from my iPhone, my track is the red one, and the two blue tracks are from others that I downloaded at home. Below White Bear Lake I meet "Sherpa" Paul from San Anselmo, for a second time. He was the first person I met on my last section. Like me, he left the crampons home for this section and took some small Vargos for traction, whereas I took Microspikes. He has an admirably small pack and is going at a fast clip. He gambled at White Bear Lake and survived. He is still the only person I have met on the SHR to-date. Lake Italy is deceptively large and takes a long time to traverse its length. In his guidebook, Roper is disdainful of the lake, which he considers featureless and unattractive. This portion of the hike is packed with lots of alpine drama. Lake Italy is the first kink on the right. 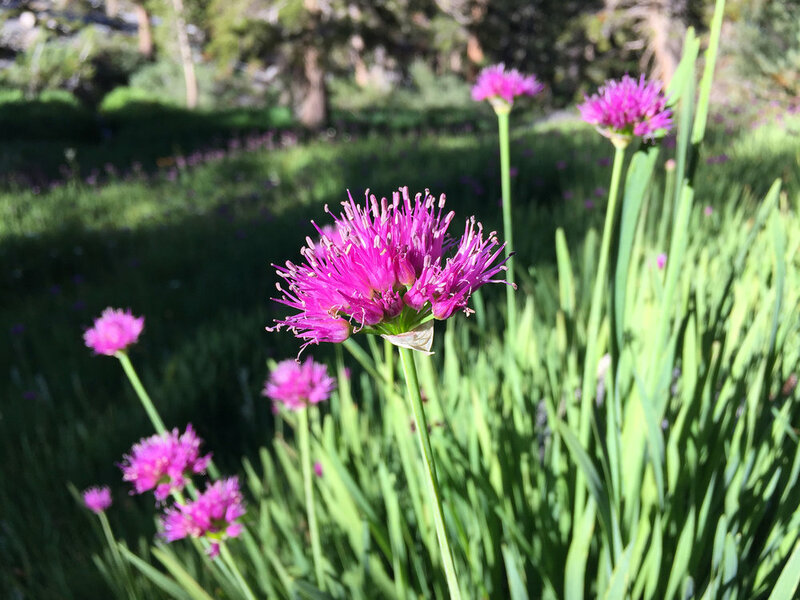 I rise to Gabbot Pass (12,300 ft), then descend to Mono Creek at 8,800. ft., and then ascend again to Bighorn Pass (11,200 ft) and Shout-of-Relief Pass (11,400 ft). It is very early and the descent is frozen-hard ice. The Microspikes allow me to descend much faster and safer. As I descend the scenery becomes greener and more friendly. The second and third people I meet on the SHR are Sprout and Michael. They are half my age and go twenty-percent faster, but I manage keep up and we camp together that night above Laurel Lake. Michael proudly declares the last time he had a fixed address and is intent on hiking for years before getting another job. Sprout is a NOLS instructor from Colorado. The next morning Sprout and Michael quickly outpace me and take off, intent on reaching Mammoth and pizza tonight. The Tully Lake area is very scenic and I regret not spending more time here. After two weeks of hiking I am surprise myself by hiking much faster and stronger. I keep knocking back the miles until I reach Barney Lake where I realize that if I continue into dusk I can make it to Mammoth. I arrive at the Mammoth Cold Water Camp in the dark, not terribly optimistic about hitching a ride in the dark to make it to town. Miraculously, a car appears, and four guys my age who were pals at UCSD pick me up and take me straight to the last open restaurant. At the restaurant I realize that my waiter is the person who gave me a ride down from Tuolumne two weeks earlier. I call ahead to reserve a room, get in my car, and that night I am in a bed in Bishop. It all happened so fast, and just hours earlier I thought I would have to sleep in some buggy campground. Sort of like the home run in the 9th inning that instantly ends the game. 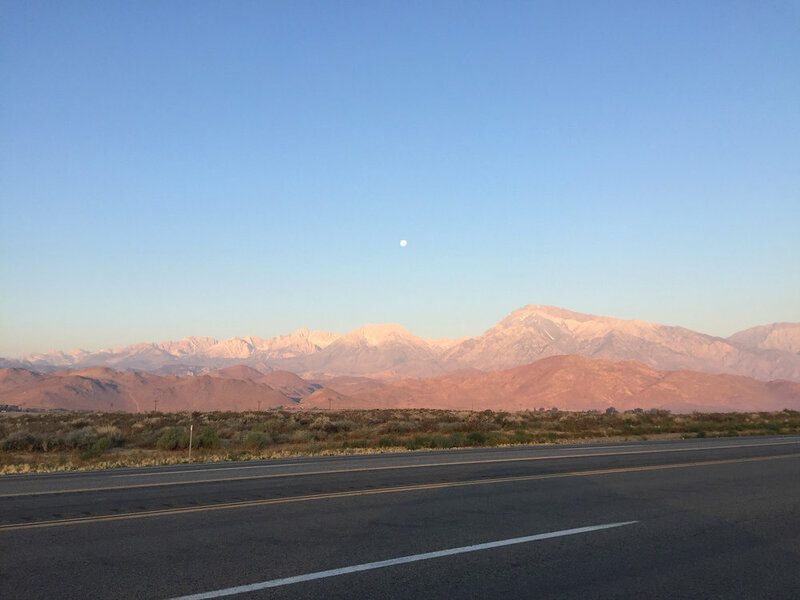 I take my customary warm-down drive home, stopping at Manzanar along the way. Section 4- August 23-27, 4.5 days. South Lake to Roads End, SOBO, then August 28-29 to Onion Valley. For this final portion of the hike I am unexpectedly accompanied by Reeve, shown in the foreground of this photo at the Alabama Cafe. Reeve almost always passes on my hikes because he lives for surfing and hates missing any wave opportunities. However the surfing forecast is grim and so he joins me. The Cafe is packed, and an older couple graciously beckons us over to share their table. It turns out that the man at this table lives in San Diego and is a legendary Hawaii big-wave surfer. He regales us for a half-hour of surf tales while his wife looks on amused, as she has most certainly heard every tale a million times. Good vibes to commence a trip, Reeve is stoked. "Sherpa Max" Fuhrman shuttles us from Onion Valley, where we leave the car, to South Lake where we begin our ascent up Bishop Pass. The good vibes continue. 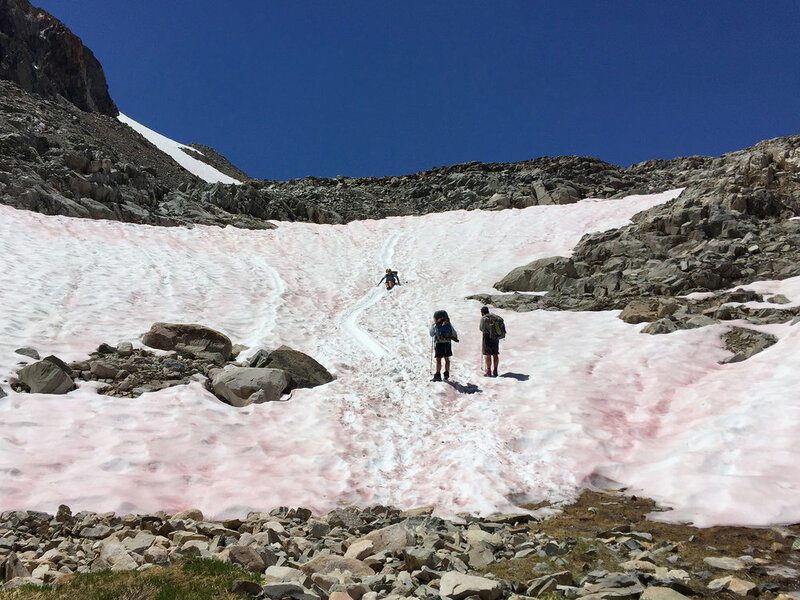 The red snow this year is unusual, but now when you step on it, it turns orange. I believe that it is wind-blown algae. Hail storm at the top of Potluck Pass. 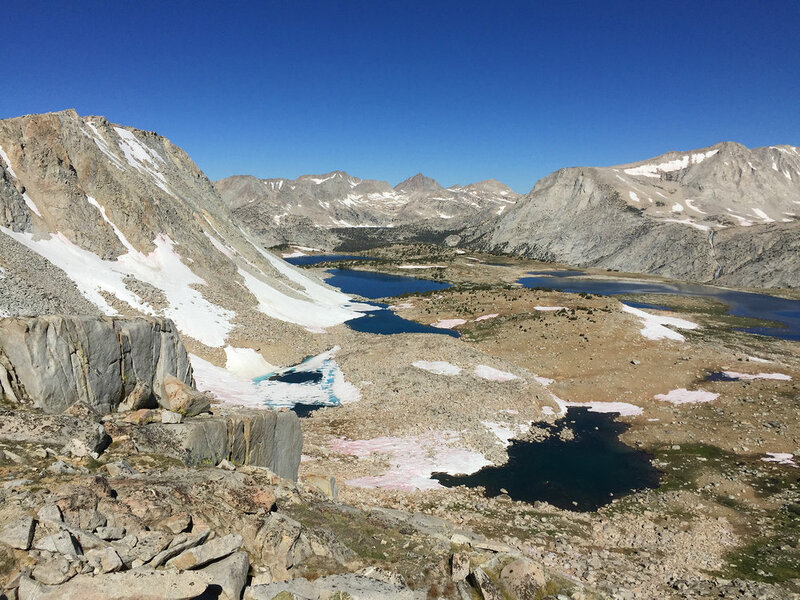 The descent to the Palisade lakes and the JMT. We set up the tarps at dusk in an area between the two Palisade Lakes. The scene atop Mather Pass with the usual JMT suspects. The guy who works at Google has an array of electronic devices which don't hide the fact that he obviously has not bathed in weeks. The usual SHR route is to leave the JMT at this point and go off-trail up and over Frozen Lake Pass, shown as the major depression in the center of the photo above. Because Reeve is not experienced in off-trail travel, I did some advance research on the difficult passes, and we continued hiking. Three passes can get us to Lake Basin, where we need to go. I chose Vennacher Col. The approach up to Vennacher is enjoyable, with a combination of firm talus and walkable slabs. Scale is difficult to judge in photos. Note the figure in the lower right foreground. Along the way I find this mysterious organic item with a color that bears a clear resemblance to the colored snow. We get to the top, and Reeve has a minor freak-out. This is a Class 3 descent, and I realize that I made a mistake in picking this pass. Whoops! Nothing to it but to do it. This Google Earth view tells the story. The drop over the pass is steep and the path down is not clear when you are at the top. I am comfortable with it, but for a neophyte like Reeve this is a stiff and scary challenge. I lead Reeve down, step by step, handhold by handhold, and very slowly we make our way down. He does fine. We make it to a shelf overlooking the Lake Basin below and enjoy a mosquito-free beautiful evening under the stars. On this hike I rely heavily on my Gaia iPhone app to move quickly and assuredly. I earned my navigation merit badge a long time ago and have nothing to prove to myself by not using technology. However I always still carry maps, in this case the map set prepared by Andrew Skurka, and they are useful for discussing routes with a second person. The Lake Basin is one of the most verdant and beautiful areas of the entire route. Reeve captured several photos of me at Marion Lake with this ray of light. It must be Divine Providence. This plaque is mounted at a beautiful spot facing the lake. Memorium like this in the Sierra are rare. Marion Lake has an otherworldly blue color. 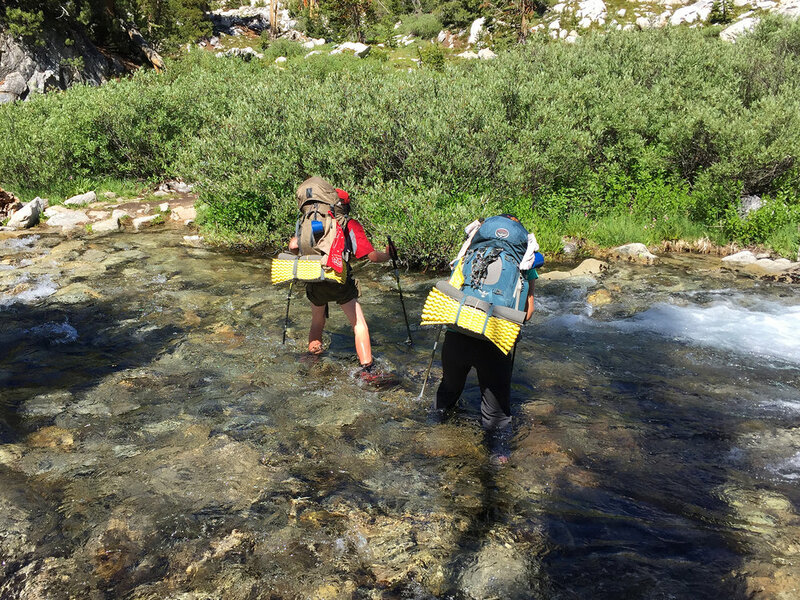 We meet the fourth and fifth hikers who are doing the SHR: Linet from Sonoma and Green Rocks from Carmel. They only just discovered each other walking in parallel on the route a few hours earlier. Green Rocks gains his name by finding jade rocks. Reeve received a gift jade rock. Our last night on the route at Horseshoe Lakes. We meet George and Jason, two professors from Dartmouth College sporting the latest in New Hampshire sports attire. They are section hiking only this portion of the route, and Jason is very concerned about tackling Frozen Lake Pass. Grouse lake. I am debating if we have the time to swim as we have a very long way to go today. 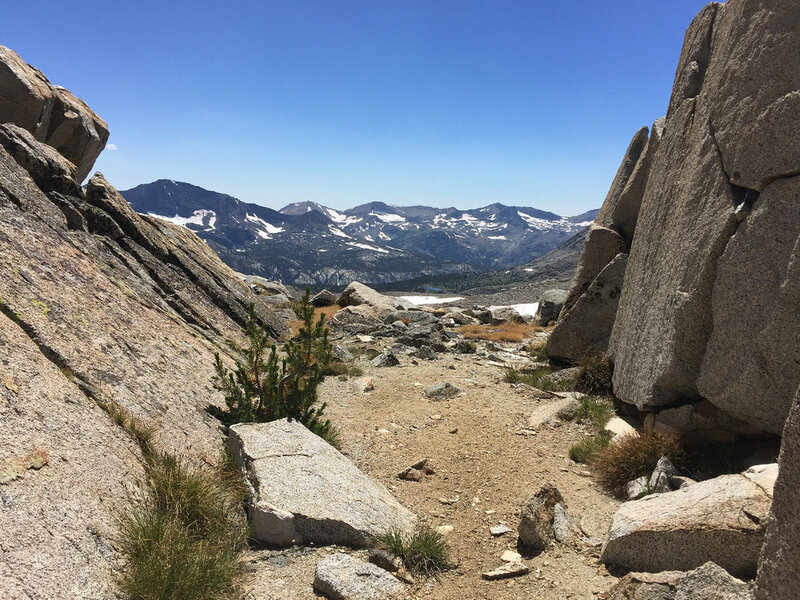 Granite Lake lies beyond as we begin the infamous 5,000 ft descent to Roads End and the conclusion of the Roper Sierra High Route. It is a long distance that becomes a 14-hour trudge into the night. Reeve's headlight fails so we have to struggle down the path with only one headlight, but at least the steep trail down is in good condition. The next morning at Roads End. There is nothing like arriving at a destination after a long hike to find hot showers and food. The trailhead parking lot is deserted but a Ranger drives us down to Cedar Grove where all the amenities are, and is then waiting for us when we emerge from the restaurant to go back to the trailhead. What service! In truth, the Ranger was probably very bored of driving back and forth all day with no action, but we are very appreciative.. I am pretty much in compliance here except that I left my SHORTS/PANTS at home. The resupply day forbidden fruit: yoghurt, fruit cocktail and Frappuccino for breakfast; double-size grilled cheese, french fries and coke for lunch. Snickers, Bonbel cheese, Clif bar, Fritos and pilsner for the trail. The end of the SHR at Roads End lands us on the other side of the Sierra. Many people decide to take all day to drive around the Sierra to make it back to the east side and their car. I favor taking a zero day at Roads End and then cranking out all 23 miles in one day to walk across the Sierra to where we left our car at South Lake. Reeve prefers to break it up into two days, so we take off from Roads End at 3 PM to knock off 10 miles today. We spot this rattlesnake along the path. Reeve and I are both tall, and as we are wearing near-identical clothes that vaguely resemble Forest Ranger uniforms, I begin to realize that some people we meet on the trail act spooked until they realize that we are not going to bust them. The glorious Bubbs Creek Valley. No mosquitos, but the Sequoia "face flies" are out in force, so the headnets bring relief. Surfers are preternaturally attracted to water, and even when there is no surf they still go out, and then size up the day: "At least I got wet". We join the JMT for only two hours but amazingly we run into Reeve's high school friend Ben who is completing the JMT. They agree to go surf Thursday. This Google Earth view shows most of the 23 mile trip from Roads End to Onion Valley. At the top of Kearsarge Pass some thunder quickly turns into 2-second thunder-lightning intervals. We throw off our packs and crouch, and I wonder if we are going to die. To this day I question my judgement about going over the pass at that time and the danger I placed us both in. Mexican food at the Bonanza, two beers, and the familiar Dow Villa.